Which cereal encouraged consumers to take a 10 Day challenge intended to combat "feeling sluggish, uncomfortable and a little irregular"? 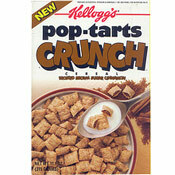 "New Kellogg's Pop-Tarts Crunch Cereal! Frosting, Filling, Crunch and Sprinkles Together for the First Time in History!" Pop-Tarts Crunch Cereal came in two varieties: Frosted Brown Sugar Cinnamon and Frosted Strawberry. It debuted in grocery stores in September 1994. The cereal was promoted with the line "They're Pop-Tarts for your spoon." "Two ways to enjoy the goodness of new Kellogg's Pop-Tarts Crunch Cereal: Now you can enjoy the goodness of Kellogg's Pop-Tarts in a cereal. New Kellogg's Pop-Tarts Crunch Cereal. You don't have to toast these, you just pour on milk and enjoy their wholesome grain goodness. Choose from delicious brown sugar cinnamon or delightful frosted strawberry. Try both kinds of New Kellogg's Pop-Tarts Crunch Cereal. They're a whole new way to enjoy the goodness of Pop-Tarts toaster pastries." 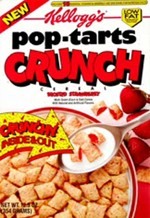 When Pop-Tarts Crunch was introduced, both varieties featured a back panel titled "The Incredible History of New Kellogg's Pop-Tarts Crunch Cereal". The tongue-in-cheek story credits Prehistoric Man for the idea of FROSTING after noticing snow-covered berries and The Earl of Sandwich for the concept of FILLING after inventing the sandwich. 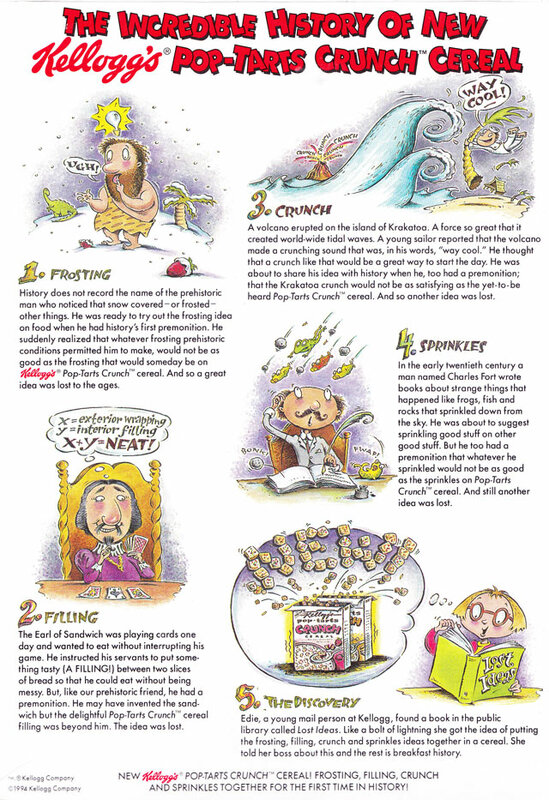 Other humorous explanations are offered for CRUNCH and SPRINKLES. The first 6 ingredients listed for the Strawberry version were corn and oat flour, sugar, yellow corn meal, partially hydrogenated vegetable oil, salt and baking soda. 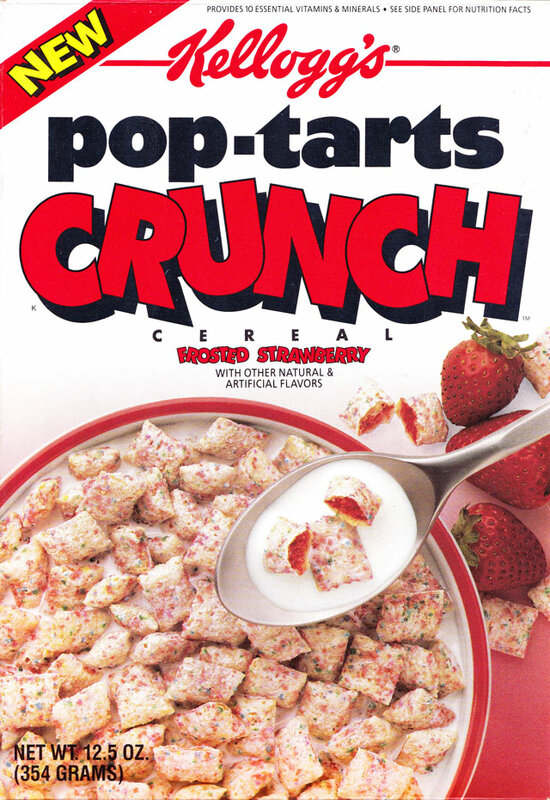 The box for the strawberry variety touted the cereal as being "low fat" and "crunchy inside and out". 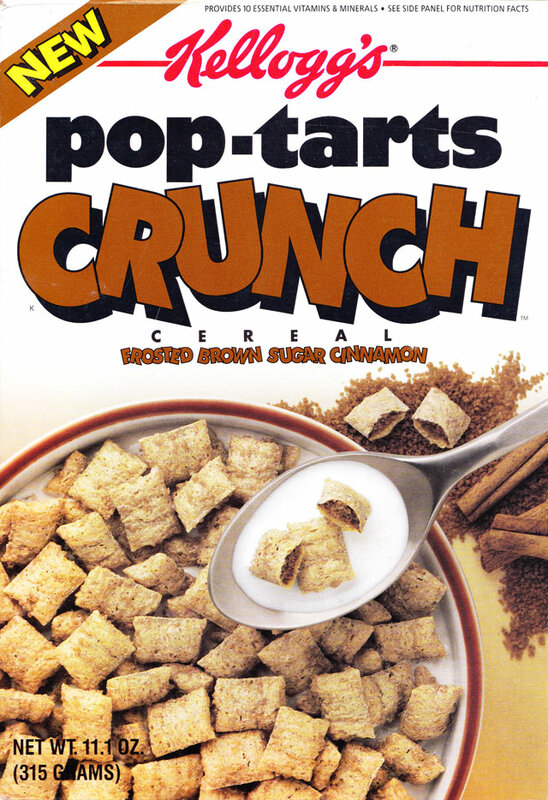 The first 6 ingredients listed for the Brown Sugar Cinnamon version were corn and oat flour, sugar, brown sugar, corn syrup, yellow corn meal and partially hydrogenated vegetable oil. UPDATE: It's been announced that new Pop-Tarts cereals will be released by Kellogg's in early 2019. The flavors will be Frosted Strawberry and Frosted Brown Sugar Cinnamon. At this point, it looks as if the new cereals will each be called a "Pop-Tart Cereal" as opposed to "Pop-Tart CRUNCH" cereals. Click here to see all cereals from Kellogg's. What do you think of Pop-Tarts Crunch? View all 82 comments for this cereal. It was so delicious. We would even snack on this cereal without milk, especially the strawberry one. I don't think any berry flavored cereal has matched that yummy taste. One of the best snacks I remember from my childhood. My favorite cereal ever! I would love to see it back on shelves. Same recipe please. No need to tamper with perfection. I would eat it for breakfast, lunch and dinner and then again as a midnight snack. Simply orgasmic. Wow, I can't believe I forgot about this cereal. This had to be possibly my favorite cereal too now that I think about it. I remember buying a few boxes of the Strawberry Pop Tart version and they were so good. It's probably a good thing they don't bring these back. I'd probably become unhealthy in no time eating them box by box. Great cereal though. Probably one of the best of discontinued cereals. They NEED to bring this cereal back like yesterday. 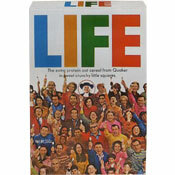 I loved this cereal and I was so disappointed when it was no longer on the shelves! BRING IT BACK PLEASE! It was so delicious. I vaguely remember this cereal but I never had it. If you guys really want to bring this back, go to the Kellogg's website and request it. The strawberry was the best! Unfortunately, I hardly remember what it tasted like, but I know it was my favorite cereal for years. Please bring it back! Everyone loved it, so it would make a lot of people very happy... Imagine the Wild! Berry flavor as a cereal. I would eat that until I explode. I have tried remembering what this cereal was called for so long. I could even remember how it tasted but couldn't remember the name and I just googled cereal of the 90s and as soon as I saw the box, I was like THAT'S IT! I was born in 1991 and ate this when I was little and still remember loving it. Bring it back!